Her warm, informal style has persisted, despite the muttered disapproval of the old guard, formed under the rigid regime of Bashar’s father Hafez al-Assad. It doesn’t take much to cause ripples in a staid Arab society, so the impact on Syria of its British-born first lady, Asma Assad, has been nothing less than seismic. From the moment she married the country’s president, Bashar al-Assad, she threw away the rule book. The first thing she did, for instance, was to disappear from public view. When she surfaced, three months later, it turned out she’d been travelling around the country incognito – in T-shirt and jeans – wanting to assess Syria’s problems for herself and get to know people before they had any preconceived notions about her. She is adamant, however, that Islam has been unfairly demonised. “When we associate extremism with religion, we’re being too narrow,” she says. Such reflections have given an urgency to her drive to tackle poverty in Syria. “There is no time to waste,” she says. Nora bint Abdullah Al-Fayez An expert on girls’ education became Saudi Arabia’s first woman minister on Saturday as part of a wide-ranging cabinet reshuffle by King Abdullah that swept aside several bastions of ultra-conservatism. Nora bint Abdullah al-Fayez, a US-educated former teacher, was made deputy education minister in charge of a new department for female students, a significant breakthrough in a country where women are not allowed to drive. “This is an honour not only for me but for all Saudi women. In the presence of a comprehensive operational team, I believe I'll be able to face challenges and create positive change,” she told Arab News. Fayez said she would study the state of girls’ education in Saudi Arabia before commenting on the task before her. 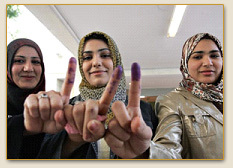 Baghdad - Women candidates are expected to fill many of the seats on provincial governing councils when results of last month’s nationwide elections are certified later this week. But winning public acceptance in this male-dominated society is another matter. Iraqi law requires that about 25 percent of the 444 seats on the 14 new provincial councils go to women - even if it means giving a position to female candidates who didn’t win as many votes as some men in the Jan. 31 balloting. Cairo, Egypt - Amira Khairy is mobbed by housewives kissing her cheeks in greeting as she arrives to give a lesson on reciting the Quran to women at the Al-Sedeeq mosque in a Cairo suburb. Up to a 1,000 students set up chairs for the class, and soon the hum of chanting female voices fills one of the building’s larger chambers. On any given day, several hundred women buzz around the mosque, organizing clothing drives, cooking meals for the poor or teaching women to read. Al-Sedeeq also has medical clinics and a day care center for children of women who do volunteer work at the mosque. All the activities are organized by women - not the mosque’s male administrators. It’s a startling sight in Egypt, where mosques have long been a man’s realm. These women aren’t Western-style feminists seeking to change the faith’s teachings on women. But their presence is challenging assumptions on women’s place and turning some mosques into women-friendly social hubs. Women often bear the brunt of war, poverty and disease in sub-Saharan Africa, and often receive little help dealing with the consequences. But the NGO Women for Women says it’s working to rebuild lives to help women regain their strength and stature in society. To help deal with poverty and lack of development in Sudan, Women for Women has obtained land for farming. “Last year, we got 90 hectares of land from the community leaders. It is an agro-business for the women. Women are cultivating more than 21 types of vegetables,” Karak Mayik, country director in Sudan, says. Many communities and businesses now depend on produce from the farm. And Mayik says that income from the farm has changed women’s lives. “They benefit from the farm in many ways. First, for themselves. They say we’re looking smart now. We’ve changed our lifestyles. They are sending their kids to the schools, to the hospitals,” Mayik says. The One Million Signatures Campaign that demands the end of discriminatory laws against women in Iran, has been awarded the Simone de Beauvoir Award which was established in memory of this Feminist writer. The Campaign, “One Million Signatures Demanding Changes to Discriminatory Laws,” also called the "Change for Equality" campaign, is a campaign initiated by Iranian women’s rights activists in Iran which aims to collect one million signatures to demand changes to discriminatory laws against women in Iran. This campaign is a follow-up effort to the peaceful protest of the same aim, which took place on June 12, 2006 in Haft-e Tir Square in Tehran. Other international prizes awarded to the campaign include the Reporters Without Borders and Deutsche Welle prize for its website; and the Olaf Palme Prize for one of its activists. The call to action is endorsed by 45 women’s organizations and individuals including the National Congress of Black Women, Organization of Women’s Freedom in Iraq, American Muslim Voice, author Alice Walker and journalist Laura Flanders. The four aid groups include: the Palestinian Medical Relief Society, the Gaza Community Mental Health Program, the Union of Palestinian Women’s Committees, the Palestinian Agricultural Relief Committees and the Palestinian Center for Human Rights.